Attachment and Interaction traces the early roots of attachment theory and the work of its creator, John Bowlby, presenting recent theoretical developments and their clinical applications in an accessible style. Bringing new and original ideas to the main theoretical points, the author explores such questions as how attachment theory can guide a critical exploration of how therapists work with their patients, and what the practical implications are of using such an approach. The book is divided into four parts. 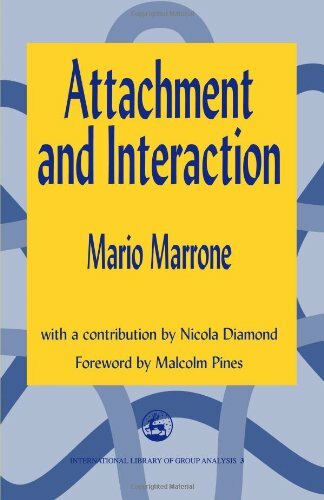 In the first, Marrone relates basic concepts from John Bowlby's seminal work to recent developments in attachment theory and research. The second part is an exploration of the relationship between attachment theory and contemporary psychoanalytic ideas, and part three discusses the clinical application of attachment theory to individual and group analysis, including a critique of iatrogenic interventions. In the fourth part Nicola Diamond looks at the way John Bowlby's position conflicted with the psychoanalytic orthodoxy of his time. She further examines controversial issues raised by Bowlby's work, suggesting that in order to appreciate fully his contribution a rethinking of philosophical premises is required. Mario Marrone is an associate member of the British Psycho-Analytical Society and the Independent Group of Psychoanalysts as well as a member and teacher of the Institute of Group Analysis and London Centre for Psychotherapy. He is also supervisor and training therapist for the Centre for Attachment-Based Psychoanalytic Psychotherapy. He has been a member of the Experts' Committee on Mental Health Promotion for the European Commission (Brussels) and the Board of Directors of the International Association of Group Psychotherapy. He has worked as a psychiatrist for the NHS, has lectured internationally and is now in full-time private practice as a psychoanalyst. He had supervision with John Bowlby for ten years, and he founded the International Attachment Network. Nicola Diamond holds a PhD in Psychoanalytic Studies and has worked as a psychotherapist in the NHS. She is a psychoanalytic psychotherapist and trained with the British Association of Psychotherapists of which she is an associate member. Previously a university lecturer in the social sciences and in developmental psychology, she is now a senior lecturer responsible for the PhD programme at the School of Psychotherapy and Counselling, Regents College and acts as an examiner for PhD at the City University. She has been invited to teach in psychoanalysis for training organisations such as The London Centre for Psychotherapy and The Centre for Attachment Based Analytic Psychotherapy and has lectured internationally. She also has a private clinical practice. She is a member of the Steering Committee of the International Attachment Network and one of the founding members of the organisation.